Goodbye Bop. 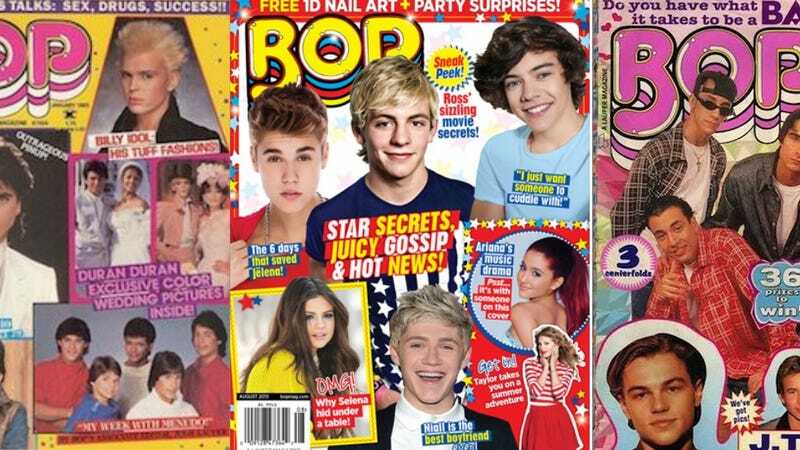 Published by Laufer Media since 1983, the company also responsible for Tiger Beat, it was reported Thursday that the teen magazine would stop publishing monthly and begin releasing only special issues. Boy Culture got wind of this news, noting that this makes Tiger Beat Laufer's only remaining regularly publishing teen mag of this type. Let's remember the golden years when life was full of endless locker posters of every heartthrob on the planet. It's really hard for Vanilla Ice to make friends, RIP River Phoenix and, because life is beautiful, Wil Wheaton had his own advice column. Asking the tough questions: "Should Tom Cruise Worry About Becoming Unpopular?" "What Keeps Jay Ferguson On His Toes?" and "Is Christian Slater In A 'Tight' Bind?" All Hanson, all day; Beanie Babies PLUS NSYNC; we all want to know if Britney Spears is stuck up or down; and "Where has Devon left his heart?" Kevin Jonas (a dude who got married because he was saving himself) doesn't rush into love; who exactly is this Pierre you speak of? ; and YIKES Hillary Duff is stressed. Vanessa Hudgens goes by "V"; apparently Bop knew Nick Jonas was going to try and go solo long before everyone else did and the magazine makes it clear they are "your number one source for the truth!" Bop's biggest issue ever! ; did you know you can only get this in Bop? and One Direction fever.